Ms. Schinzing graduated from the Oklahoma City University School of Law in 2014 with a Juris Doctorate degree. While in law school Ms. Schinzing was Vice President of her graduating class, Vice President of the Student Bar Association, President of the Sports, Property and Entertainment Law Association (SPELA) and President of the Animal Law Group. Ms. Schinzing was a Merit Scholar and earned placement on the Dean's list. 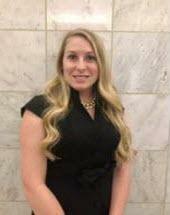 Ms. Schinzing is a member of the Ruth Bader Ginsburg American Inn of Court and received the award for Outstanding Oklahoma City University School of Law Pupil in 2014. While in law school, Ms. Schinzing participated in the Oklahoma Licensed Legal Intern Program where she interned with this firm. Ms. Schinzing is a native of Texas. In 2010, Ms. Schinzing graduated first in her class in the business program from Hillsdale Free Will Baptist College where she received a B.S. degree in Business and a minor in Psychology. While attending Hillsdale, Ms. Schinzing was a three-sport intercollegiate athlete, twice an Academic All-American, President of the Alpha Epsilon Xi -Louisa May Alcott Society and President of Rotoract. In college, Ms. Schinzing interned at the Oklahoma State Capitol in the House of Representatives during 2009. Ms. Schinzing is admitted to practice law before the Supreme Court and all inferior courts of the state of Oklahoma. Ms. Schinzing's law practice is exclusively comprised of consumer collection litigation and she is the vice president of the Oklahoma City Commercial Law Attorneys Association.